Operating procedures have always been crucial to the safety, quality, and productivity of process systems. And with the advent of new safety and quality standards such as OSHA’s process safety management (PSM) regulation, OSHA’s personal protective equipment (PPE) regulation, EPA’s risk management program (RMP) regulations, and the ISO 9000 quality standard, many companies are facing the daunting task of developing or upgrading their procedures to satisfy varied and sometimes complex or conflicting requirements. Although there are overlapping characteristics that the various regulations and standards share, each approaches the procedure-writing process from a somewhat different perspective (e.g., quality or safety, protection of workers or protection of the public/environment), and the required level of detail for documenting the procedures differs greatly between these regulations and standards. The key is to remember that the ultimate goal of the regulations and standards is consistent: reduce human errors that can impact quality, productivity, and/or safety. Procedure-related errors are errors that occur because some characteristic of the procedure caused task performance to fail. This is currently the most critical human factor at most sites since 90% of accidents have at least one root cause related to mistakes within procedures. 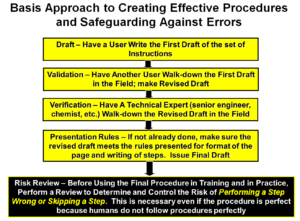 Reducing these procedure deficiencies can usually reduce human error rates by a factor of 2 to 10. This flowchart describes the basic sequence of steps for writing effective procedures. Note that one of the key rules is contained in the flowchart: “Operators writing operating procedures” and “Maintenance craft-persons write maintenance procedures” and “Lab technicians write lab procedures.” Procedures should Not be written by engineers or department superintendents. This is a critical rule because it ensures the procedures are written in the common language of the user(s) and is written at the right level of detail. Further, this rule ensures ownership by the users. Trouble-shooting guides are a special form of operating procedure. They are written for the actions that we want the operators to take to recover from a process deviation, before an emergency situation occurs. They are called guides since rarely can we predict the process conditions at the time the action is required. Trouble-shooting guides (and training and drills of the action) are required for any action that is considered a Human Independent Protection Layer (IPL). The Action Limit is what we show as the Min or Max in a Trouble-Shooting Guide. The action limit triggers the demand to use the trouble-shooting guide. If the unit has a good PHA/HAZOP, then it is best to extract information from the HAZOP (or What-If) analysis tables to start the development of each guide. The guide is then finished with input from the process experts. Coaching following classroom training (see “Course 5” under the “Training” tab). This coaching can take 3 to 5 days initially, with continued assistance on an as needed basis (usually accomplished by phone and e-mail). Coaching is available for both operating and maintenance procedures and/or troubleshooting guides. Provide staff to supplement plant personnel in the actual development of operating and maintenance procedures and/or troubleshooting guides. Provide staff to audit existing operating and maintenance procedures and/or troubleshooting guides. PII staff understand the importance of procedure content. If the content of the step is wrong it does not matter if the presentation is clear; but if the content is perfect, you can reduce error rates an additional 50 to 70% by presenting the information properly. Customization to Client’s Needs PII finds the best approaches to risk management, process safety management, and reliability management to fit your specific needs and company culture. We deliver the highest value of service by customizing what we do to each client’s need. PII staff co-authored the definitive paper on developing troubleshooting guides in 1995.